Earlier this week, I alluded to the fact that I was lucky enough to receive a small handful of new additions to my Cubs All-Time Roster Collection, as well - three, to be specific. Apparently, my family knows me and knows what I want pretty well! I've been chasing these vintage oddball cards for a long time and the players' stories are unique enough that I feel as though it would be a disservice to cram them all into a singular blog entry; therefore, over the next few days, I'll give each individual card a moment in the spotlight, so that I might brag appropriately. On Wednesday, we began the showcase by examining the newest of the trio, John Flavin's 1983 Fritsch One-Year Winner card. Yesterday, I displayed the "middle child" of the bunch, 1945 NL ERA Champ Ray Prim's 1947 Signal Oil single. Therefore, let us continue this linear timeline by moving on to the oldest of the three gifts. Today's example is truly an antique, as it is older than sliced bread, zippers, and women's right to vote. What we have here is a 1909 Colgan's disc, featuring minor league journeyman, Walt Woods. As you can plainly see, it has some serious flaws on the surface, but that's what brought this bad boy down into my parent's price range. When the slip of paper in question is 108 years old, these sorts of dings don't bother me too much, if at all. From 1909-13, Colgan's included these small, circular cards in the small, circular tins of their unique, five-cent, Mint Chip Gum - hence their bizarre 1.5 inch diameter. Additionally, they are printed on thin stock, barely thicker than your standard printer paper; this further excuses the confectionery premium's condition. That about covers the basics of the card itself; now, how about we profile the career of the man depicted on it's front? Woods (#5) and his dapper buddy, mgr. 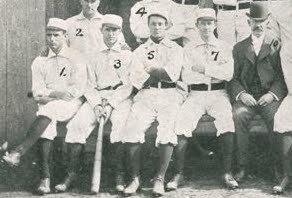 Tom Burns (#10) w/the 1898 Chicago Orphans. Courtesy of Legendary Auctions. Walt Woods' Major League Baseball career was a long time ago and did not last for a very long time. The Rye, NH native broke into the National League with the Chicago Orphans, better known today as the Cubs, 119 years ago. 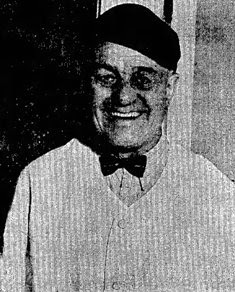 He had been playing with Tom Burns in the New England minor leagues and when his teammate took over for Cap Anson in the Second City, the skipper brought Walt along with him to the midwest. 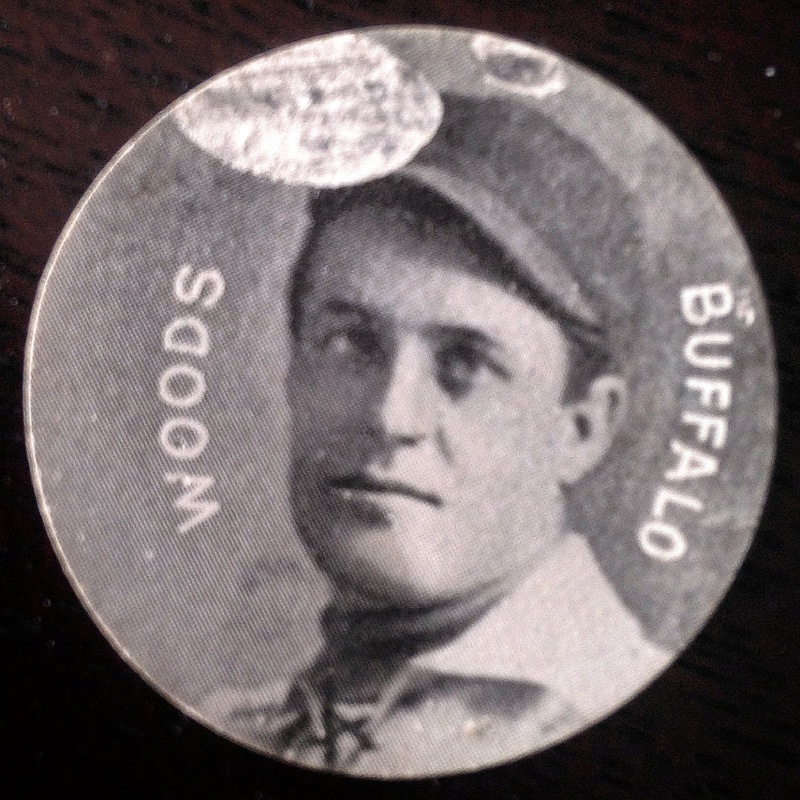 Despite having an "in" with the team's new signal-caller, Mr. Woods almost did not make the team in the spring of 1898. You see, apparently the rookie's head was not entirely in the game or his pre-season conditioning. The recently displaced ballplayer spent nearly every waking moment carrying on a passionate correspondence with his girlfriend back in New Hampsire. I suppose it's lucky for Wally that he didn't come along in this current day and age - I can see him losing countless hours to FaceTime and other social media! Get off the damn phone, Walt! Eventually, the pitcher would on the mound in 27 National League games (22 starts) for the pre-Cubs, posting a 9-13 record in 3.14 ERA along the way, as the fourth man in their rotation. Meanwhile, the fielder appeared in 23 games in the outfield, third base, shortstop, and second base. That's right, Mr. Woods was a two-way player and could do it all on the field... well, that is except for play on Sundays The teetotaler drew the line at honoring the Sabbath and thus earned the moniker as "the Sunday School Pitcher." As versatile as Woods was, he wasn't much of a threat at the plate - in '98 he batted an anemic .175. Thus, with better starting options and much better offensive choices, the Colts decided that the wannabe Shohei Ohtani wasn't worth their time. 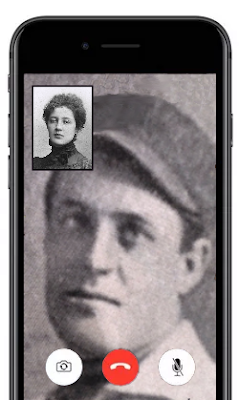 After being sent to the Louisville Colonels for their final season in 1899 and having a very similar season, Walt was transferred with several of his new teammates to Pittsburgh upon the former franchise's collapse (former Col. owner, Barney Dreyfuss, purchased the Pirates). Although, before he went, he did have the honor of taking the ball for the last game in Louisville history - against Washington, his team smashed six homers and triumphed 25-4. Woods as a Colonel in 1899, image courtesy of Baseball History Daily. Instead of going on to stardom like fellow transfers Honus Wagner, Tommy Leach, or Fred Clarke, Woods appeared in just a single game with the Buccos. He didn't exactly go out in a blaze of glory either, hurling three innings and giving up six earned runs in his swan song... eep! That said, you could stillsay that he was a hero as, during the preceding winter, he saved the life of a young boy who fell through the frozen surface of a lake. What a selfless fellow! With that, Walt's career in Major League Baseball was officially over; however, his professional baseball career was only just beginning. Deciding to drop the two-way act (since 1893, no pitcher with as many IP as Walt has notched fewer K/9 innings - 1.07), Woods would go on to star for various minor league clubs, at nearly every other position on the diamond and his career would last for yet another 14 seasons after being cut by the Steel City powerhouse. Most of his time was spent with the Jersey City Skeeters of the Eastern League and the Troy Trojans of the NY State League. Despite this fact, it is with the Buffalo Bisons that Wood is listed on the Colgan's Disc that I found under my Christmas tree, which - to my knowledge - is his only baseball card. Woods after stepping away from the game, courtesy of Baseball History Daily. 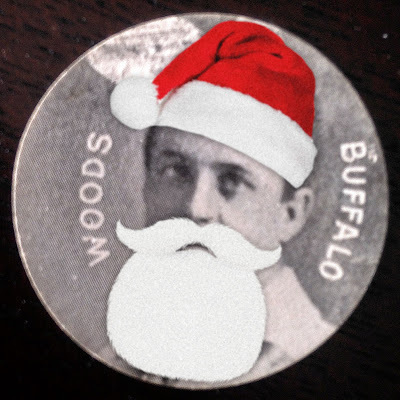 Our hero's tenure in Buffalo lasted for just a season and a half, from 1909-10. His stats from the partial year in '09 are lost to time; but, we do know that he appeared in 73 games with the team in '10, batting .190. Not exactly the most inspiring stint. You see, for about 15 years, local kids would queue up in front of the former ballplayer's house just before Christmas. Woods would then appear in an attic window dressed as Father Christmas and lower baskets of candy and toys down to the children with a rope. Then, on the big day itself, he would again don the big, red coat and beard before going around town to distribute gifts - what an amazing fellow! Also, how appropriate is it then that I should acquire his card as a Yuletide gift - it's kismet! A visual approximation of "Jolly Wally Woods"
And there you have it, the story of "the Sunday School Pitcher" - cameo Cub, two-way wannabe, minor league lifer, and Colgan's subject. Also, that covers the Christmas cards that were gifted to me by my generous parent's, in honor of Jesus' birthday - thanks, guys! Not only was I able to cross off three obscure, rare names from my "needs" list, but I also learned an awful lot about these heroes of baseball past along the way. I suppose that is the purpose of trading cards, after all, right? In conclusion, I'm thrilled to be able to add this bubblegum baseball card to my collection of cards based around a team which would come to be own by a chewing gum magnate. I know that run-on sentence was a lot to "chew" on, but I just can't help myself sometimes. What a neat addition to the Cubs collection. Congrats! Wait, what? A legit Colgan's disc? Wow! Congrats! Woof! Talk about vintage. Very nice. A 108 year old baseball card given to you by your parents. Does it really get any cooler than that? Very nice addition to your CATRC. One Year or Zero Year?